Winter time is when gardeners take a break from tending their seasonal flower beds and borders, and begin to plan the next year's plantings. Give them a variety that will usher in the first weeks of spring in style with Early Gold. 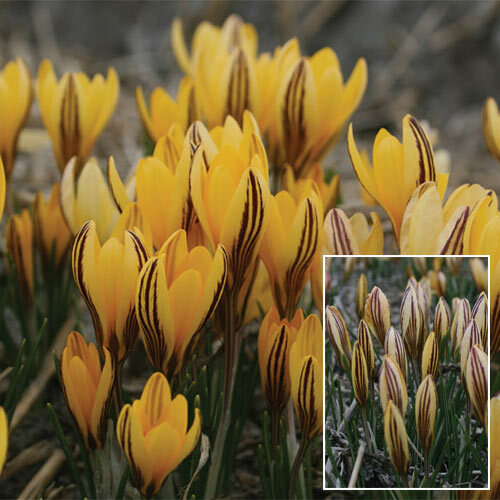 This species crocus variety delivers a wealth of rich golden-yellow blooms adorned with unique bronze, feathered stripes in February-March. Appearing in a traditional bunching habit, Early Gold is one of the first crocuses to flower in early spring, even popping up through the snow to show off its bright colors and pretty form. Like others of its kind, it is quite vigorous and naturalizes well. Suggest siting them under deciduous trees or between evergreen shrubs for a free-flowering look. Small, 2" cup shaped blooms. Multiple flowers per bulb. Average water needs. Water regularly, don't over water.